“So far this holiday season, shoppers have spent $32 billion online, 15 percent more than last year,” stated a blog on the New York Times. I think there are several classifications for the holiday online shopper. 1. The person that buys everything online. From my experience, I notice the men in my life utilizing this option than the women. 2. The person that buys a few things online, but the rest in a physical store. I fall into this category. I bought two gifts online, but do a lot of pre-shopping online before I hit the store. I need to know how it looks in real life. Is it soft? Scratchy? 3. The person that hits the mall for all gifts. This person also is the praying man; praying he will find a parking spot and praying he’ll have the patience to wait in long lines. This blog and infographic shows you know how closely your holiday shopping habits fit with the norm. It’s incredible how online shopping has taken on such a prominence in our culture over the years. Remember catalogs? My grandma still uses them, but she also doesn’t have a computer. I can’t imagine what Christmas would be like if she had access to online shopping! The most interesting thing about online shopping is the creepy all-knowing SEM advertisements that pop up every time I log on these days. For example, I was doing a little shopping for myself and was looking at shoes, dresses and jewelry. What do I see every time I log onto the Internet? Shoes, dresses and jewelry. More specifically, Mod Cloth is stalking me. I hate to give them more reason to taunt me with their cute dresses and shoes by listing them in my blog, but man, they sure know how to get a girl to notice them! I’m simultaneously amazed and weirded out by all that search can do for marketers. It’s amazing how your every move is tracked and targeted online. From a business standpoint, it’s awesome. From a consumer standpoint, it’s creepy. For some people, online shopping is not a trend to follow but instead, DIY gifts. Pinterest is an online sharing community where users can pin blogs, recipes or photos they think are cool. Other people can follow those boards and uncover endless fun things. This is an unofficial statistic, but I would guess that a billion people are giving someone a homemade gift this year because of something they found on Pinterest. OK, a billion is extreme, but some of my friends and family will be receiving homemade gifts and snacks from me and, according to my friends’ statuses on Facebook, so will their families. Whether you are buying online, shopping online or making your own gifts inspired by something you saw online, holiday gift giving has come a long way from my grandma’s catalogs. Hello, my name is Sarah and I am an addict. A Google addict that is. I think about how often I search for questions throughout the day and wonder how Google is so smart and how does it return such applicable results? A few weeks ago Kevin Grinder, of dotDIGITAL Studios, spoke to our class about search engine optimization (SEO) and how exactly Google produces such successful search results. SEO describes how a website designer produces valuable content so that Google, or other search engines, will refer searchers to your website. In order to achieve a high-ranking on a search engine, it is important to understand how a website is evaluated. When search engines discover a new website, they send out a bot to ‘crawl’ to your website and explore it. If it helps, do as I do and envision a robot sneaking over to your website like a secret shopper to evaluate its content. As the bot is reading the content on the website it looks for frequently used words and where they are placed within the page. Words at the top and words that are links are considered more important than the others. Bold words also gain priority status. 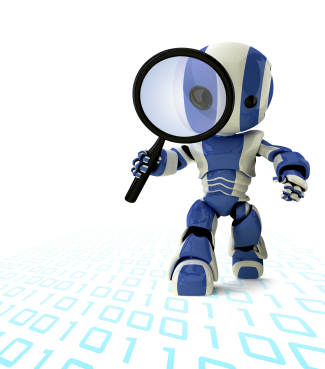 Once the bot has reviewed the content, it reports back to its search engine by indexing the keywords. For instance, a store that sells party supplies would have the word “party” frequently and at the top of the page. A bot would recognize this and tell the search engine that if someone searches for “party” this is a good resource to show them. As an organization it is important to understand how this works because people often do not view the search results past the first page. Kevin recommended researching what your target market is searching for and use those keywords on your website. Knowing how to manipulating your website’s content in a subtle way can make a big difference in the number of visitors to a website. Knowing how search engines work makes searching for things a lot more interesting and is very valuable when trying to drive traffic to a website. Who knew search engines were so complicated and smart? I for one am addicted to their wealth of knowledge.